I have been a fan of M.J. Rose’s since the publication of her very first novel, Lip Service back in 1999. Rose’s work tends to speak to me in special ways, something I’ve commented on in reviews over the years. Her w riting seems to rap up all of the elements of story that just delight me. There is an elegance to her voice, even when the stories she shares are at their most suspenseful. I not only like how she writes, I like what she writes about, too. Her stories tend to contain threads from the world of art and, quite often, there are elements of the sensuous and even the paranormal. But these are hints and threads. Despite all apearances, at their core, Rose’s books are always deeply human and startlingly real. 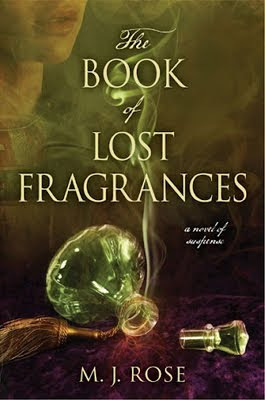 If you though the world of rare and costly perfumes was all about blue-haired old ladies, this book will enlighten you. A rollicking read, based on real characters with enough intrigue, danger, scintillating dialogue and discovery to keep you turning the pages. I loved it. If you thought the world of rare and costly perfumes was all about blue-haired old ladies, this book will enlighten you. A rollicking page-turner with enough intrigue, danger, scintillating dialogue and mystery to keep anyone entertained. If you need a book to hold your interest during a long flight or a sleepy afternoon at home, reach for this one. I loved it.